This refers to your cover story on soft drinks (Cola Dilemma, June 4). 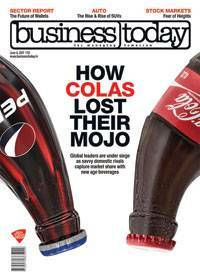 The article has elaborately explained that both Coca-Cola and PepsiCo face fierce competition from Indian cola makers. They have polarised people on their brand command rousing, extending fizz wars among cola guzzlers. Indian cola manufacturers have intelligently transformed their product portfolio to suit the palate of the changing taste of the health-conscious consumers. The self-driven wrong moves of MNCs and availability of reliable alternative drinks from domestic operators have gripped them. While India is afraid of becoming the diabetes capital of the world, these quenchers have assumed the proportion of clinchers of health norms. Pepsi's demand with the Centre for lower taxation for such beverages must be turned down. India cannot afford to be a testing ground for their questionable drinks and Indians are not guinea pigs or willing victims either. No organisation should be allowed to push the people down in the dumps. The colas are nothing but artificially flavoured and concentrated chemicals. When they are increasingly negated by the users, the makers must manage to measure up to the changing orders of the awakened customers towards individual health enrichment and social welfare of the people. Your closing comments rightly noted that the fat is in the fire for them. This refers to your article on stressed assets of banks (Hurdles Ahead, June 4). There is no doubt that at a time when we talk about the government having an arm's length from public sector banks (PSBs) so that they take decisions independently without any pressure, this latest ordinance giving power to the RBI looks like a bad idea. But simultaneously we should not forget that until and unless these NPAs get resolved, fresh lending will not revive at all. Lack of sufficient capital and fear of investigating agencies also act as a huge deterrent. So, in a desperate attempt, the government has done what it did to strengthen RBI's powers. It is disheartening that the Banks Board Bureau has not been able to implement the desired changes in the management of PSBs. In fact, how to resolve this present crisis remains a big mystery. This refers to your article on SUVs (The Heavyweights, June 4). Smart cars have all the luxury gadgets but display of air cool temperature inside the cars is rarely seen. Recently, I travelled to Udaipur and hired a taxi, its AC was not effective. The plea of the taxi owner was that the temperature outside was too high. If it is so, what is its use? To check AC cooling, I suggest that all taxis (cars) must have AC temperature display like in most indoor ACs. The display of temperature at front seat, middle seats and back seats - in case of big taxis - must be mandatory. This refers to a column on Aadhaar card (Time to Fix Aadhaar, June 4). There is no second opinion that the UIDAI evades various privacy policies that all citizens are entitled to. All arguments by the government against it are absurd and have no base or logic. The most important is that Aadhaar details can be hacked very easily. With changed technology, Aadhaar card will never be foolproof enough to prevent its misuse. The latest is ransomware - the cyber attack which proves nothing on any connected computer is safe.